Question 1: Explain what is meant by a negative externality. A negative externality is an effect of production or consumption on a market that has an unseen social cost, as it retracts from society. The result of negative externalities is a market failure, as it causes goods to be overconsumed (in the case of production externalities) or overproduced (in the case of consumption externalities). The result of this overconsumption or overproduction is welfare loss, which can be physically measured using a supply and demand diagram. Question 2: Using supply and demand diagrams, explain how negative externalities result in market failure. To understand how negative externalities cause market failure, we first must address that there are two types of negative externalities: that of supply and that of demand. A negative externality of supply is, taking an example from the article, when forest land exploited for farming destroys other wildlife which could have provided in the economy. This can be demonstrated in Figure A below. 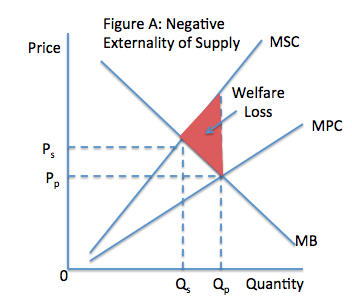 Here, the marginal private cost (or MPC), is lower than the marginal social cost (MSC). This means that is cheaper for the firm to produce than the actual cost to society, which can result, again in the example of deforestation, in severe environmental degradation. The marginal benefit in the diagram represents the demand for the firms production. With this we can see that since the firm is producing under the cost to society, quantity increases from Qs to Qp and price drops from Ps to Pp. The result is a market failure, as the firm is overproducing and the produced goods are being consumed in a way that degrades other potential in the economy, hence the greater social cost. Question 3: Explain why an increase in the level of poverty within Burkina Faso contributes to environmental degradation. An increase in the level of poverty in Burkina Faso leads to environmental degradation as there is less concern for sustainability when those involved in the production process view their production as a means of survival instead of market operation. That is, there is a certain level of severity involved when those producing are destitute, as losing sales may result in losing what little they possess. Because of this producers may feel inclined to try and produce more than can be sustained by the environment in order to secure their living. The results is environmental degradation as crop lands are not turned over properly and soil become infertile, making it useless to both human cropping and natural rehabilitation. When this happens the poverty-stricken farmers look to produce new crop land by then deforesting areas to be used in the same, unsustainable manner. Question 4: Discuss strategies that the government of Burkina Faso could introduce to reduce the extent of forest degradation. The number one way for the government of Burkina Faso to reduce forest degradation is to subsidize and promote sustainable farming. Forest degradation occurs as land previously used by farmers becomes infertile due to poor agricultural practice in order to try and produce a larger crop yield than the land is capable of. The reason this is done is because practicing sustainable farming involves both a monetary commitment and time lag that makes sustainable practice more expensive and less practical than producing for a maximum yield. However, if the government of Burkina Faso was to try and subsidize substantial factors required for sustainable farming forest degradation could be averted. This involves addressing the two major factors involved with moving towards sustainable practice. The first of these is the monetary commitment, which involves reorganizing existing farms and providing them with the equipment needed to practice sustainable farming. This can come as a direct subsidization by the government through tax cuts or equipment production subsidization. The second factor that must be addressed is the time lag. The restructuring of the farming market will involve a period when crop yield will drop due to the restructuring. The government will have to look to subsidize crop supply in the market to ensure there is plenty of harvest available for consumption to avoid inflation as the supply from the restructuring farms contracts. This could be done by temporarily increasing crop imports into Burkina Faso to take the place of local produce temporarily or could be done by delaying the restructuring until sufficient crop reserves grown in Burkina Faso could be made and then released during the restructuring period. How Can Supply and Demand-Side Policies be Used to Assist Businesses? An important concern for all economists is protecting the industries in an economy. Without adequate industries and businesses, an economy can not reach it’s full output potential, and suffers. In order to ensure that these corporations are able to survive in the economy, the government can enact a number of fiscal and monetary policies (covered in the last two posts). These include policies that are both supply-side and demand-side. A supply-side policy is a policy aimed at regulating the aggregate supply of an economy. This can include both fiscal and monetary policies. A fiscal supply-side policy is a policy aimed at supporting industry growth and change. This includes government spending to increase private research and development in order to increase the economy’s efficiency, increasing AS. Additionally, The government can cut business taxes to allow more business spending and expansions, or even improve transit systems to reduce business costs. A monetary supply-side policy is a policy aimed at regulating the flow of capital in the economy. By either bringing more capital into or draining money out of the economy, the government can alter the money flow and therefore regulate the AS in the economy. A demand-side policy is a policy aimed at regulating the aggregate demand of the economy. This can include both fiscal and monetary policies, covered in previous blog posts (see below). These policies look at altering the AD of an economy in order ensure consumer security by preventing (or provoking) a recession or inflation. In order to protect business in the economy a government can reduce production costs associated with the aggregate supply and increase aggregate demand in order to increase consumer spending. By improving the economy’s infrastructure and reducing business tax and production costs (like wages), a government can reduce the aggregate supply of the economy. Then, by increasing spending on consumer benefits, such as working incentives, the government can move the AD in order to protect the businesses in the economy. How Can Monetary Policies Be Used to Assist the Elderly? In an economy, economists face difficult decisions when dealing with the retired population. A retired population within an economy acts with much differently than a working population. The working population depends on income in order to build assets and be able to buy goods and services in their life. But, by the time a member of the working population chooses to retire, they depend completely on the assets they’ve built during their working lifetime in order to support their livelihood. 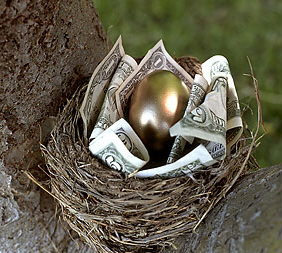 However, one of those assets is generally a large nest egg saving deposited in a bank. That means that these investments are reliant upon the interest rates imposed by the banks to allow them to grow. By incorporating monetary policies, a government can protect these savings for the retired population in the community. 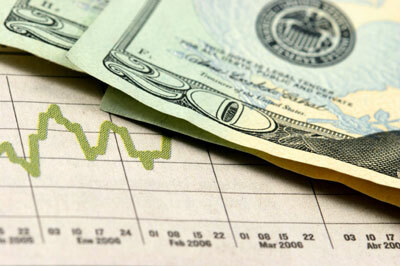 A monetary policy represents a policy that adjusts the interest in the economy. By raising interest rates, the government can effectively protect the savings of the elderly by assuring their assets grow steadily on an annual basis. This works because as the interest rate increases, the saving grows by a larger percentage annually.